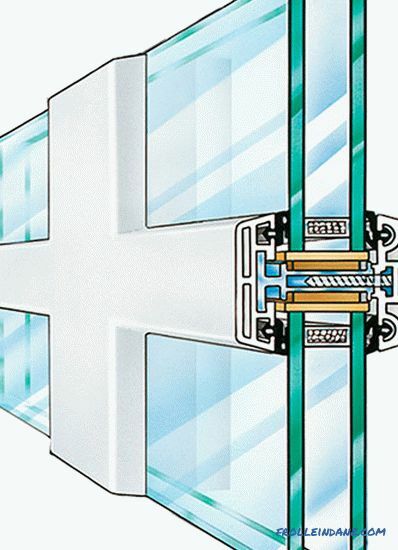 The heat-insulating and noise-protective properties of metal-plastic windows directly depend on the quality of the double-glazed window inserted into the frame. Many buyers mistakenly think that the operational data of the PVC window is determined solely by the profile parameters of the frame, so they pay little attention to the glass unit. And it occupies more than 80% of the area of ​​the whole window and affects not only the light transmittance of the structure, but also the level of heat preservation and sound insulation in the house. A variety of glass packs are available on the market, differing in thickness and type of glass, number of glasses, and thickness. To choose the right window, you need to know what are the glass for plastic windows, which parameters to pay attention to and which are minor, which qualities are really useful and which are nothing more than promotional "chips." Structurally, a glass pack consists of two or three parallel glass sheets installed at a certain distance from each other. 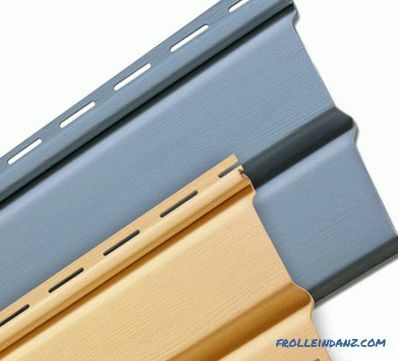 Sheets are glued to a special design - a spacer frame made of metal or plastic of a given width. allows you to remove excess moisture from the chamber. 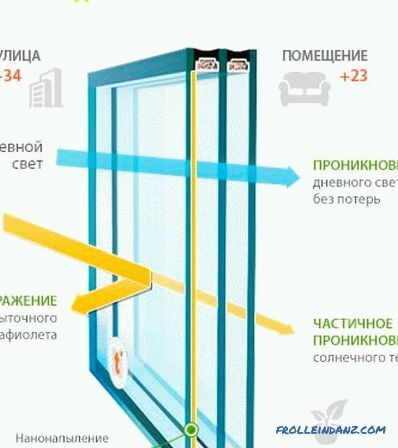 According to GOST 24866-2014, Russia produces two types of double-glazed windows - single-chamber (ACT) and two-chamber (SPD). Single-chamber consists of two sheets of glass and one spacer frame, two-chamber - of three sheets of glass and two frames. The same GOST provides for other designs consisting of four or five sheets of glass. But such double-glazed windows are made most often by special order and make up a small percentage of the total production of windows. Glass for double-glazed windows is used only by the highest grade M1, the so-called float glass. It is produced by a very interesting technology, invented in the UK in the 50s of the last century. It consists in the fact that melted glass (a mixture of sand, dolomite, soda ash and lime, T melting ≥ 1000 0 C) is poured into a bath of a given shape on a layer of molten tin (T float. = 232 0 C). The tin melt has all the properties of a liquid, the main of which in this case is the formation of a perfectly flat horizontal surface. The high density of the metal eliminates the appearance of waves and the mesenchy of air movements. A glass melt is poured onto a metal mirror, which spreads over the surface with a layer of predetermined thickness and cools to full crystallization temperature. A sheet of glass obtained has an exceptional accuracy of parameters, high transparency and the absence of defects that occur most often during uneven cooling. A portion of float glass is used immediately after cooling, and a portion is subjected to quenching — re-heating to a high temperature, below the melting point and quenching. As a result, the internal structure of the material changes, it becomes stronger and safer. When destroyed, it crumbles not into fragments, but into rectangular pieces, unable to cut or injure a person in any other way. Some windows are built on the basis of precisely tempered glass. The most common double-glazed window. It is used in almost all windows for technical purposes for offices, industrial premises, commercial establishments, restaurants, cafes, warehouses. 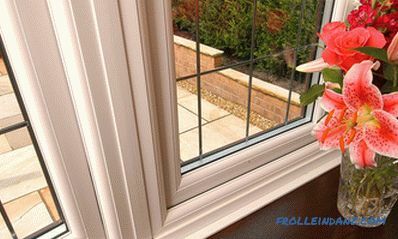 A significant part of PVC windows in houses and apartments are also equipped with single-chamber double-glazed windows. 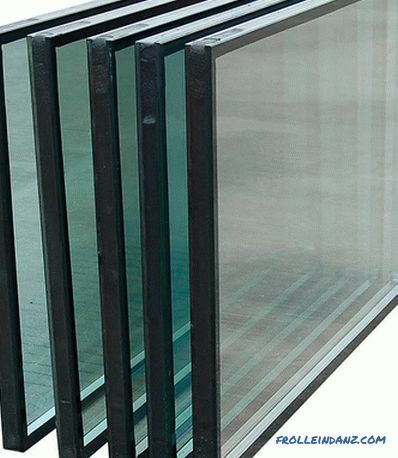 The thickness of the glass unit is in the range of 24 - 54 mm with a glass thickness (standard) of 4 mm. Part of glass packs can be made of thicker glass, but the overall width of the pack does not go beyond the permissible range. 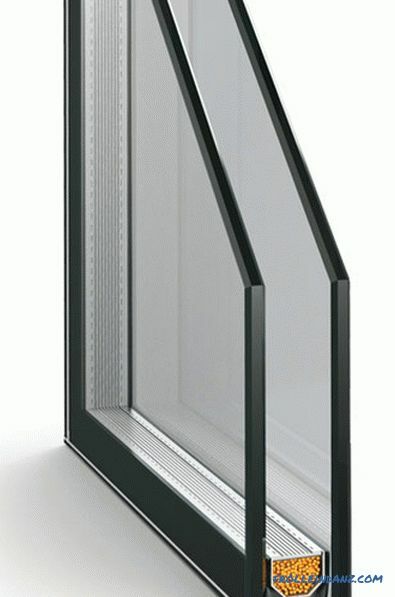 It is very convenient to use single-chamber double-glazed windows with the use of energy-saving glasses. One of the main advantages remains - the lightness of the design, and the heat-shielding properties increase significantly. This design is also included in the main types of double-glazed windows for plastic windows. Recently, an overwhelming number of windows for the residential sector has been produced with this type of glazing. The total width of the package does not exceed the dimensions of the single-chamber - 18 - 54 mm. Three sheets of glass with a thickness of 4 mm occupy 12 mm of the width of the glass unit; the rest falls on the air chambers. Naturally, the widest glazing has the highest level of insulation. The sound insulation level of two-chamber double-glazed windows is much higher than that of single-chamber glass, but it can be further increased by using distance frames of various widths - in this case sound waves are actively extinguished as a result of asynchronous glass vibrations. They are used more rarely than two-chamber and much less often than single-chamber ones. 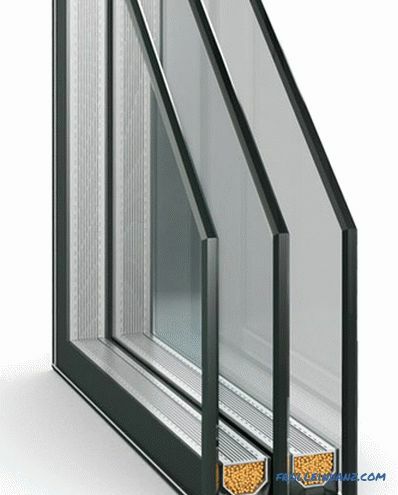 Three-chamber windows (4 sheets of glass, 3 spacers) are justified only in the case of windows in a very cold climate with an increased width of the frame. In conventional windows, in addition to accelerated wear of the loops and a decrease in the intensity of natural light, there is no longer any effect. The same restrictions apply to four-chamber windows, which can only be considered as special designs for special operating conditions. The main properties of the double-glazed window - heat permeability and sound insulation largely depend on the gas that is pumped into the chambers. The light transmission capacity practically does not depend on this - here the main role is played by the characteristic of the glass itself. Dry air is pumped into ordinary double-glazed windows of a budget level, it has a sufficiently low thermal conductivity, high transparency, and the chemical composition does not differ from atmospheric. In more expensive glass units, argon, krypton or xenon are used - inert gases that are completely harmless to humans. 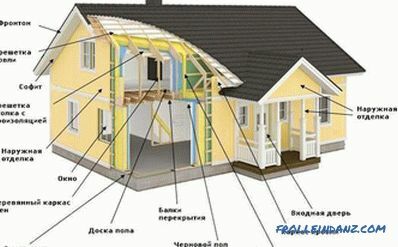 You should not be afraid that in case of damage of the sealing layer these gases will penetrate into the room. Even if this happens, they do not pose any danger. In terms of price, such double-glazed windows are somewhat different, it depends not so much on consumer properties, as on the cost of gas. The cheapest is argon, the most expensive is xenon. Inert gases exhibit their main qualities when used in double-glazed windows equipped with energy-saving glasses (i or k). But even with ordinary glasses, some indicators are improving, although the changes are not so dramatic. protection of internal i - oxidation spraying. But with obvious advantages, double-glazed windows filled with inert gases are not without flaws. The main one is that the gas must be pumped under pressure above atmospheric. This requires increased strength of the sealing layer at the end of the glass. The high penetrating power of the inert gas determines its leakage through the slightest seal defects. Even in the best double-glazed windows for the year evaporates up to 3% of the gas. The average effective service life of an energy-saving window filled with an inert gas is 10 years; after this period has expired, the glass unit must be refilled with gas. This is associated with some inconvenience and unnecessary costs. 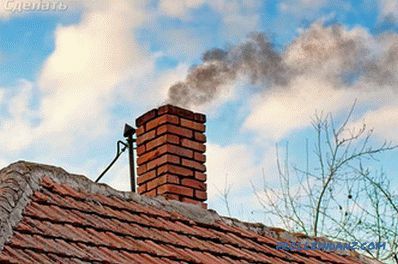 In addition, there is another risk factor - inert gases are odorless and colorless; it is extremely difficult to determine what exactly is being pumped into your window. If you buy an expensive window from a trusted manufacturer, then you can be sure that it is an inert gas in the chamber. But in other cases, such confidence is not 100%. The main types of double-glazed windows for plastic windows are a standard Noe float glass and air as a filler. The practice of using double-glazed windows shows that this is the most practical option, both in terms of performance and price. Qualitatively made one or two-chamber double-glazed window fully satisfies all requests put forward to plastic windows and in conditions of temperate mid-latitudes nothing better can be desired. But progress is relentless - PVC window manufacturers are constantly working to improve designs.Sometimes the differences between ordinary glass and advanced are clear only to specialists. 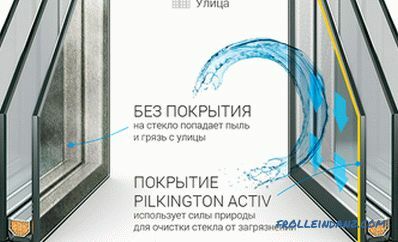 Some innovations look, at first glance, completely unnecessary, but on closer examination, the benefits are quite real and significantly improve the functionality of metal-plastic constructions (both windows and doors). The first and one of the most common improvements concerns glass as the main element of a double-glazed window. In multifunctional glass units, ordinary glass is used to spray silver or chromium molecules. Practically invisible under normal lighting, it does not transmit long-wave radiation (infrared spectrum), which allows you to avoid overheating the room in the heat when exposed to direct sunlight. In addition, in cold weather, such double-glazed windows help to preserve heat, since the applied coating reflects the heat from the heaters inside the room. At the same time, the entire visible spectrum passes through the glass without delays and restrictions - the light transmission capacity of the glass unit does not differ from ordinary glass. The coating is made only on the glass, which is inside, in the case of a single-chamber package - on the inner plane. 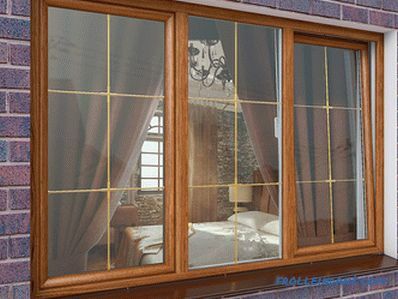 It is very stable and designed for long-term use, practically its durability does not differ from the lifetime of the entire window construction. This design of a glass unit allows you to keep up to 30% of heat in a house more than a conventional glass unit, which results in a reduction in the consumption of heat carriers. 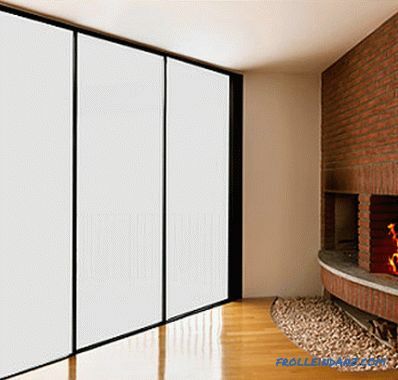 Particularly beneficial such windows in homes with autonomous heating system. Also, multifunctional glass has a reinforced noise insulation. Light mirror effect reduces the possibility of viewing the room from the street, and the retention of a significant part of the UV light protects indoor plants from overheating. A very practical and convenient invention. Glass from the outside is covered with a special transparent substance that has the lowest possible level of adhesion to most household and technical pollution. Coating also has the ability under the action of ultraviolet to decompose any substances adhering to glass. The resulting products are easily washed off by rain or showered by the wind. Dirty water on these glasses does not leave stains and stains. If there is no rain for a long time, you can simply wipe the glass with water from a hose from a garden pump or water mains. 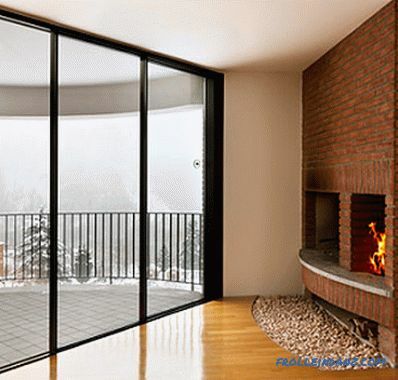 Such glasses in windows of high-rise buildings, glass facades, shop windows are very convenient, it is also practical to install them in the cottage or house in fixed doors of wide windows. Self-cleaning glass has the same transparency as usual. In one set, you can combine self-cleaning glass with energy-saving or tempered glass, increasing the versatility of the glass. Comfort in the house depends on several parameters, among which one of the main ones is silence. For cottages or country houses it may not be so important, but for apartments (shops, restaurants, offices) that overlook windows on busy streets or highways, insulation is absolutely necessary. The design of noise insulating glass units is somewhat different from normal. Thicker glasses are used here, up to 6 mm. External glass is usually a triplex glass. As a rule, for soundproof windows three-chamber double-glazed windows filled with argon or krypton are used. These gases have a lower sound conductivity than air due to greater density, which determines a more tangible resistance to the propagation of sound waves. Often, noise insulating glass units are made with cameras of various widths - this reduces the risk of resonant oscillations and the amplification of certain sound frequencies, instead of attenuating them. Even a difference of a few millimeters can significantly increase the level of sound insulation. 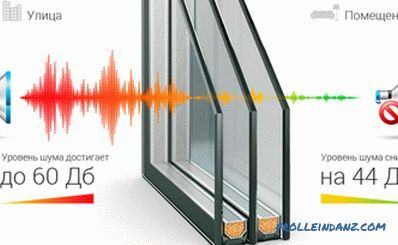 The overall level of reduction of external noise in such double-glazed windows is quite realistic to reduce by 25 - 30 dB. Even next to the six-lane highway, the noise level in the room will be no higher than 55 dB, which corresponds to the level of quiet conversation or the working noise of the office. The same windows overlooking an ordinary city street will reduce the noise level to a barely audible 30 dB. Sound insulating glass units cost a little more than usual, but an increase in expenses of 25–30% is fully justified - comfort in a house is more important than money. Moreover, there will be a little need for sound insulation packages - one or two windows go out onto the busy and noisy streets. Double-glazed windows with a mirror coating are relevant not only on the ground floor - often mirrored glass completely changes the exterior of a house and turns a quite ordinary, unsightly building into an architectural masterpiece . In addition to high protective properties (from UV light and immodest looks), they also have an increased level of strength. The thinnest metal film has a high resistance to random mechanical effects and is absolutely not afraid of abrasives - silver or gold metal is sprayed onto internal surfaces and does not interact with the external environment. When turning on the interior lighting in the house, everything that happens in the room becomes clearly visible on the street, as when using ordinary glass. Save on curtains and blinds will work only in offices or shops. Double-glazed windows with colored glass are usually used as part of the decoration of the facade. But possessing indisputable design possibilities, they do not lose even purely applied ones. 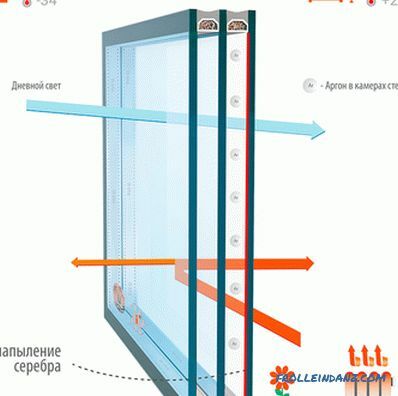 Colored glass perfectly protects the house from excess ultraviolet light, does not allow to view the room from the street, at the same time letting in enough daylight. Also, using colored glass, you can create original interior lighting, giving a certain color. In most cases, the color of the window is attached to special glass films glued to the glass using the lamination method. But it is possible to meet and painted throughout the volume of glass, the composition of which in the manufacture of various compounds are introduced, changing color without loss of basic qualities - strength, heat resistance, chemical inertness. 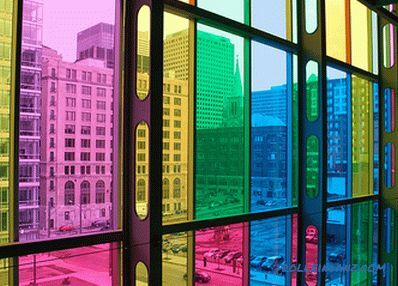 The first version of glass packs is more common - the relatively low cost allows you to produce colored windows in an industrial way in any size. Colored glass, painted in an array is quite rare, such glass packs can be ordered individually only from a few manufacturers. In addition to their attractive appearance, colored glass also has increased strength. Laminating film prevents cracking of glass in case of accidental impacts and is not inferior in strength to triplex or hardened. But when ordering color glass packs, you should not get carried away with the saturation of color - a light shade is enough, not too reducing the transparency. A special case of colored glass units are tinted (darkened) by gluing special films. These windows are very appropriate in modern interiors, but, in addition to decoration, and have excellent performance properties. Especially on the south, southeast side of the building or in the hot climate zone. In the latter case, not heat-insulating properties come to the first place, but the window's ability to protect the room from direct sunlight and high temperature of the outside air. The word SMART that is fashionable in the modern world is applied to self-regulating systems that react in a certain way to changes in external conditions. 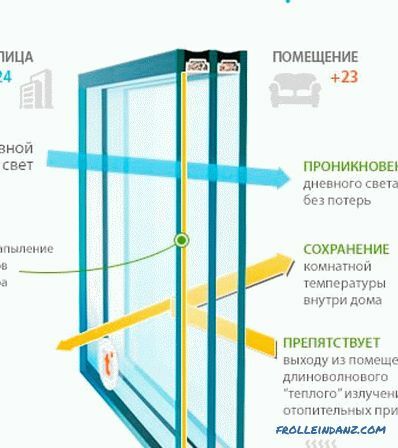 In relation to the windows, these are complex glass units, changing the level of transparency and thermal conductivity depending on the external conditions. A complex layer is established between the glasses, fed to an external current source, which reacts to changes in light intensity and temperature. The complexity of the system determines the rather high cost of such windows. Most often they are used in the systems of "smart home", differing in complexity and high price of the main components and components. If in such a house the cost of a “smart” window is 2 - 3% of the total cost of equipment, then in an ordinary apartment or cottage they will exceed 20, or even 30 percent of the construction costs. The essence of these glass packs is that a thin layer of metal oxides, mostly silver, is sprayed onto ordinary float glass. From it reflects the waves of electromagnetic radiation. In practice, this is reflected in an increase in the heat reflecting ability directed to the side with a higher temperature. This contributes to the absence of heat in the summer, in a room protected by such windows, and the minimization of heat losses in the winter. The thickness of the deposition in 0.4-0.6 microns does not reduce the transparency of the window, but greatly enhances it mechanically. K-glass is characterized by comparative simplicity of technology and does not add too much to the cost of the whole structure. 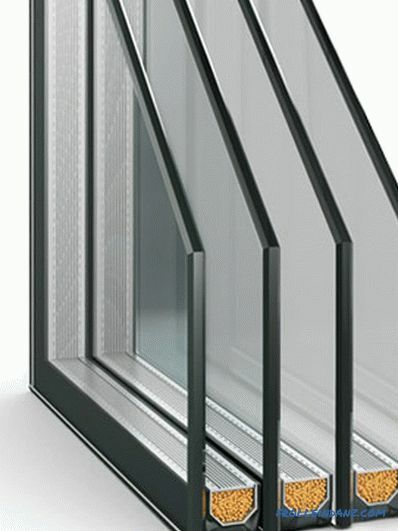 If there is a choice between k and i-glass, then it is definitely necessary to dwell on the K-variant.In addition to the lower cost, throughout the life of such windows will not bring any surprises. The technology for making glasses for such bags is much more complicated than “K”. The deposition is carried out in vacuum and provides a kind of "sandwich" deposition, alternating oxide and metal layers (oxide-metal oxide). The thickness of the metal layer (most often silver) is not more than 10-15 nm (10 -9 m). Even such a thin layer of metal reduces the thermal conductivity of a package by 90% without changing the light transmission. But the coating is quite vulnerable to external influences, therefore, it is made exclusively on the inner surfaces of the glasses. At a comparative cost with K-packages, i-variants allow to save 20% more energy used for heating. 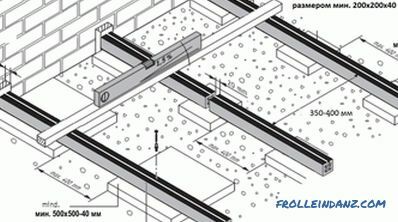 In addition, they are also 20–40% lighter, which makes it possible to install single-chamber, i-packs of any size in walls with not very high load-bearing capacity and in large area constructions such as shop windows, facades, panoramas. The main requirement for glass packs that are installed in windows on the lower floors or in industrial premises is strength. Of course, it is almost impossible to protect glass from breaking, but it is easy to protect the window from accidental impacts and wind load. 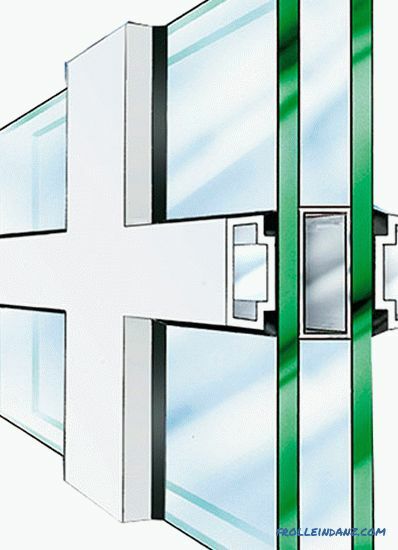 For these purposes in the glass used: triplex, tempered or reinforced glass. 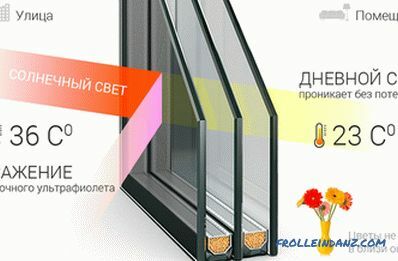 They have a sufficiently high strength, transparency and reasonable price. 1. Triplex is a multi-layer construction of float glass and plastic film, glued with transparent glue. When damaged, the sheet does not crumble into fragments, pieces of glass remain glued to the film and do not pose a danger to others. 2. Red-hot glass undergoes heating to a certain temperature (above the melting point T) and rapid cooling in air or technical oils. As a result, its strength significantly increases and its physical properties change - strength increases by 3–5 times, and bending resistance is no less than 2 times. With the destruction of the formation of small pieces of parallelepipedal shape, unable to injure a person. 3. Reinforcement is carried out by gluing on the glass of the polymer mesh or mounting it inside the glass during the production process. Sometimes not polymer, but steel mesh construction is used. This glass has a rather original look and somewhat reduced transparency, but its strength is not inferior to metal. Most double-glazed windows are a regular plane without excessive decor. But other options can be used, for example, glass with sleeves - decorative metal profiles installed inside the glass unit. The width of the profile is in the range of 8 - 26 mm. The color of the bolts is silver, gold, bronze. They have a rather decorative look, but they have practically not been used recently. In addition to the interrogations, false plates are used - decorative elements of various configurations that are attached to the glass. They do not have any influence on the strength and tightness of the glass unit, but allow you to adapt any window to the peculiarities of the exterior of the building. There are many options for manufacturing glass packs. If there is a choice, then professional builders should be attracted to it - windows are not bought every year, and they cost a lot. From their quality depends on the comfort of housing and a healthy atmosphere in the house.